Nostalgia is the way of current advertisements. I’d say—by cursory glance—that about half of movies coming out now are based on previous intellectual properties. For every new thing, we bring back an old thing. This is because they expect us to buy what we already know. This world flies so hard and fast toward the future that some appreciate the flying back for a time. Ghostbusters was a recent example of people milking the past (and I liked that movie despite its flaws) and recently we also had Trolls as another nostalgia product. But, while some may use nostalgia to advertise old stories and characters, what about another aspect of those bygone times: the product advertisements? Before we had a bevy of ways to view something without many ads, we all had to crowd around television sets and watch advertisement-heavy cable programming. And those advertisements now have their own sort of nostalgia. Some as recognizable as the Teenage Mutant Ninja Turtles or the Care Bears. And, since it’s December, I figured I’d narrow the focus to more winter and Christmas-friendly fair. Takes you back, doesn’t it? Back to when a television set could crackle? Brings back that moment of staying inside on early morning Christmas day and watching television after opening presents. The soft, muted energy. It’s not bombastic. It does not try to sell with power fantasy, or gorgeous women, or thumping music, or even go weird to make someone do a double take. This, this little advertisement, tells the simple story of a kid who needs a warm cup of soup. The song is calming, friendly, and it’s not flashy. Sure, it doesn’t snow in Clearwater, but I think anyone can enjoy this as a piece of media regardless of your normal weather expectations. And sure, old media has that too, in spades, but these few, these few classics, were calm and showed something nice and happy, perhaps even a little silly, and made the product out as a friend. 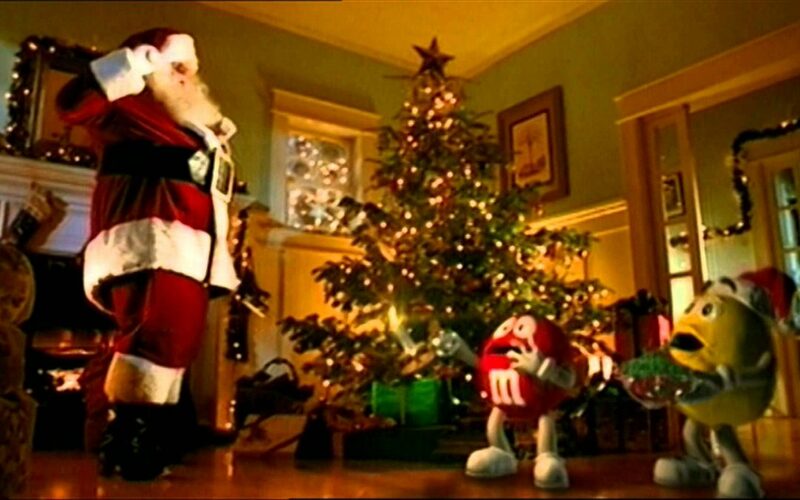 You can imagine the red and yellow M&M as a buddy, just as much as you might be able to with Frosty the Snowman. It not only harkens back to what our brains perceive as a simpler time, it’s also a simpler presentation. The holiday season is, I think, geared toward simplicity—at least in theory. Oh sure, consumerism and such, but if there’s anything the myriad of Christmas specials tried to teach, it’s that we need to get to the root of the holidays more: closeness. To enjoy the basic things of life like friendship, and family, and love—for at least a little while. And these advertisements, whether intentionally or not, captured that perfectly.